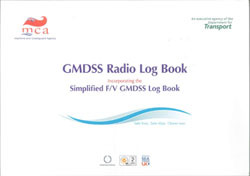 In order to assist Masters and Officers in maintaining the necessary records, the Maritime and Coastguard Agency (MCA) have updated the 'Radio Log Book' (GMDSS) and 'Simplified Fishing Vessel GMDSS Radio Log Book', and incorporated them into this single volume (logbook). For ease of use a 'delete as appropriate' and 'complete as required' system has been adopted, which allows this Log Book to be used as either publication, dependant on the user's specific requirements. This Log Book is intended to encourage greater awareness of safety equipment through inspection and the recording of such inspections. Safety equipment has reduced in cost and improved in availability over the last 10 years. As vessels fit more equipment, and to ensure the equipment functions correctly when needed, an inspection regime is required. This would improve familiarity with the equipment, thus improving safety. A copy of the Radio Log Book must be made available to any seaman who requests it in accordance with the provisions of Regulation 20 of the Merchant Shipping (Radio Installations) Regulations 1998 and Regulation 19 of the Merchant Shipping (Radio) (Fishing Vessel) Regulations 1999. This updated publication supersedes the 'GMDSS Radio Log Book - 2000 Edition' (ISBN 9780115522406) and the 'Simplified FV GMDSS Radio Log Book' (ISBN 9780115522499).